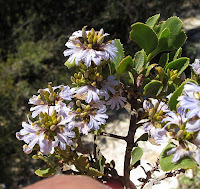 Scaevola is a genus from the large Goodeniaceae family and are commonly known as Fan-flowers. They are separated from genera like Lechenautia, Goodenia and others by only having 1-2 ovules (becoming seed when fertilised) per ovary, which generally produces larger seed that can have germination and seedling survival advantages in drier environments. 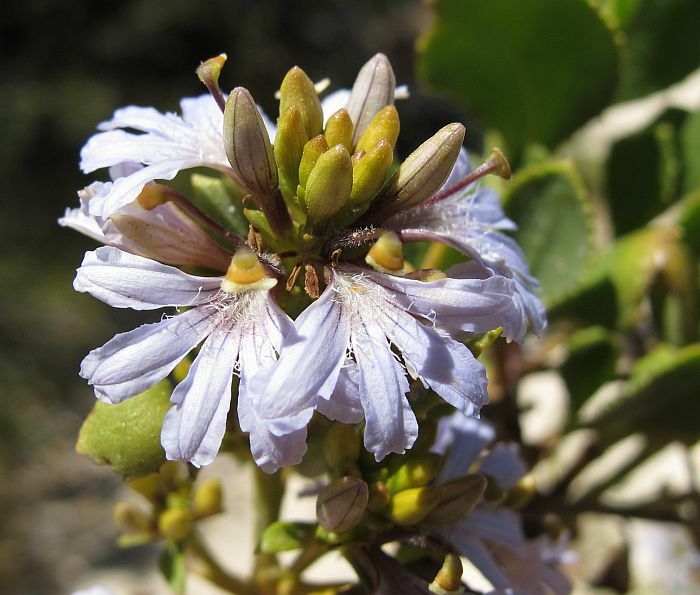 Scaevola crassifolia is a near coastal shrub favouring calcareous (alkaline) soils commonly over limestone, these conditions dry rapidly without regular rainfall, so any small advantage can mean the difference between survival or not in such unsparing conditions. 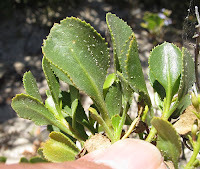 The flexible leaves are not prickly, although are quite thick and slightly sticky to touch (viscid), but effective against salt spray and being sandblasted by strong coastal winds. 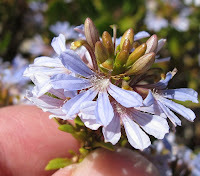 In more sheltered gullies and amongst other vegetation they can grow to around 1.5 metres (5’), but are more often well under a metre (2'-3’) in exposed positions, although they can spread 3 metres (10’). 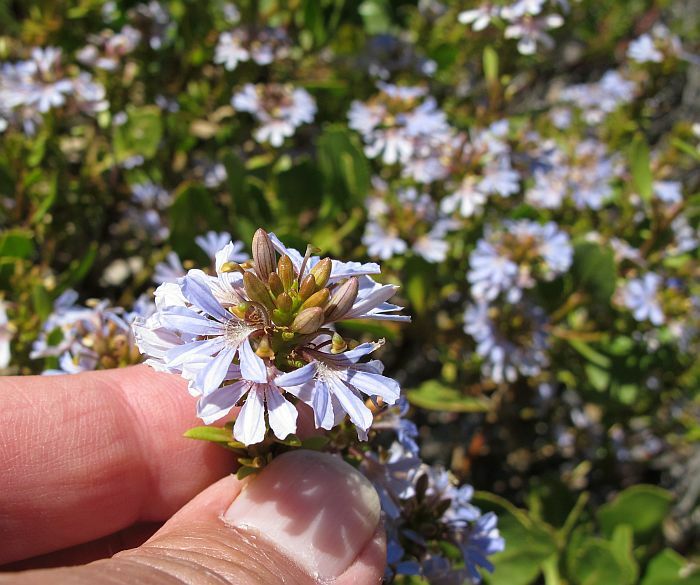 The Thick-leaved Fan-flower is a prolific bloomer and will produce over several months. 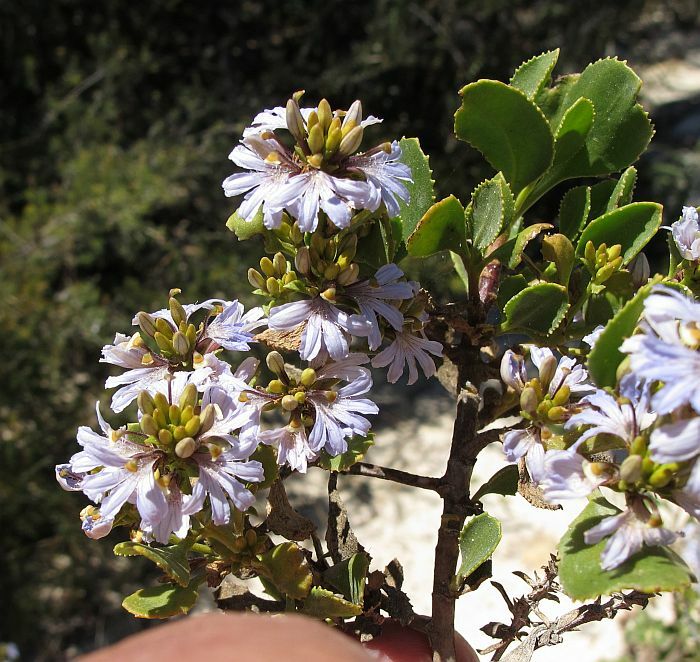 The flowers are around 1.5 cm (over ½”) diameter and occur in compact spikes that open progressively, making them long flowering. 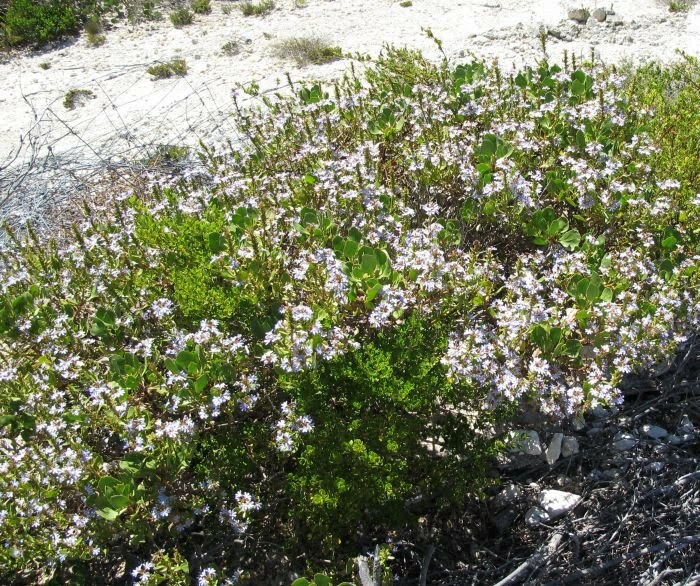 In sandy calcareous coastal areas and offshore islands, this species can be found from above Karratha on the northwest coast to South Australia (almost to the Victorian boarder) on the southeast coast. That is something like 4500 km or 2800 miles, so a highly successful species! 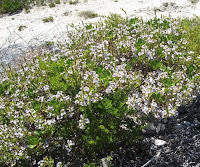 For a plant to grow over such a large distance there are numerous colour forms from white to deep blue, but around Esperance, they tend to be mauve, or a light blue and occasionally white. 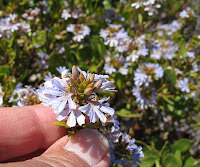 Likewise flowering times will vary and are recorded from July to February, but locally October to December would be the main period, although some flowers are invariably found at other times.